One of my favorite new products last year was the VIOlight Toothbrush Sanitizer, which struck a chord far beyond its target market of neat freaks and germophobes. (Lots of people, it turns out, have been experiencing free-floating anxiety about their toothbrushes being bacterial breeding grounds.) Now VIOlight has a little brother you can take on the road. 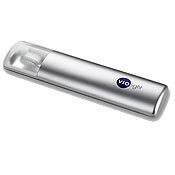 The new VIOlight Travel Toothbrush Sanitizer is a sleek toothbrush travel case that uses a seven-minute dose of UV light to kill 99.9 percent of the germs lurking in the bristles of your brush. It turns off automatically, flips open for cleaning, and weighs next to nothing even with two AA batteries installed. Traveling just got a tiny bit less disgusting.